You can define concrete mix design as the method of choosing the perfect components of concrete and finding out their proportional amounts (ratios of cement, sand and aggregates) to develop a concrete maintaining the necessary strength, stability, and workability as reasonably as possible. The following point should be taken into consideration at the time of designing concrete mixes: Cost, Specification, Workability, Strength and durability. In this regard, an exclusive video tutorial is presented by the renowned engineer Mukesh Shaw. 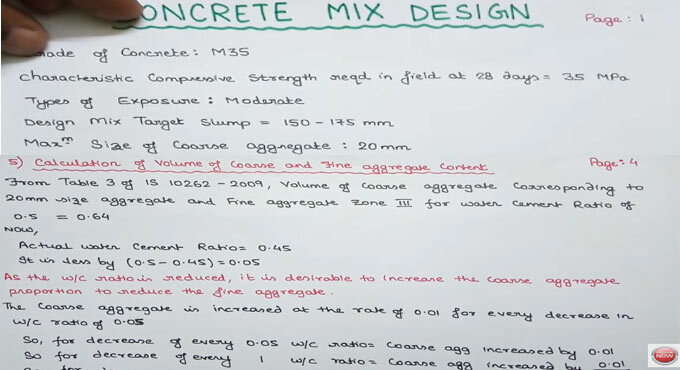 The video teaches you how to perform mix design of concrete following IS code 10262.